'The existing literature identifies several prominent sources of uncertainty, including those related to the magnitude of local warming per degree global temperature increase, the sensitivity of crop yields to temperature, the CO2 levels corresponding to each temperature level (see section 3.2), and the magnitude of CO2 fertilization. 'In addition, although the studies summarized in Figure 5.1 consider several of the main processes that determine yield response to weather, several other processes have not beenadequately quantified. Nearly 40% of global maize (or corn) production occurs in the United States, much of which is exported to other nations. The future yield of U.S. maize is therefore important for nearly all aspects of domestic and international agriculture. Higher temperatures speed development of maize, increase soil evaporation rates, and above 35 °C can compromise pollen viability, all of which reduce final yields. High temperatures and low soil moisture during the flowering stage are especially harmful as they can inhibit successful formation of kernels. In Northern States, warmer years generally improve yields as they extend the frost-free growing season and bring temperature closer to optimum levels for photosynthesis. The majority of production, however, occurs in areas where yields are favoured by cooler than normal years, so that warming associated with climate change would lower average national yields. The most robust studies, based on analysis of thousands of weather station and harvest statistics for rain fed maize (>80% of U.S. production), suggest a roughly 7% yield loss per °C of local warming, which is in line with previous estimates (USCCSP, 2008b). a 5 to 15% yield reduction per degree centigrade of a number of crops. (US corn, African corn and Indian wheat). That means for certain the world is far beyond dangerous climate interference. 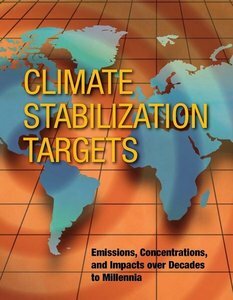 Just consider that international policy is still targeting a 2 °C of global warming!! 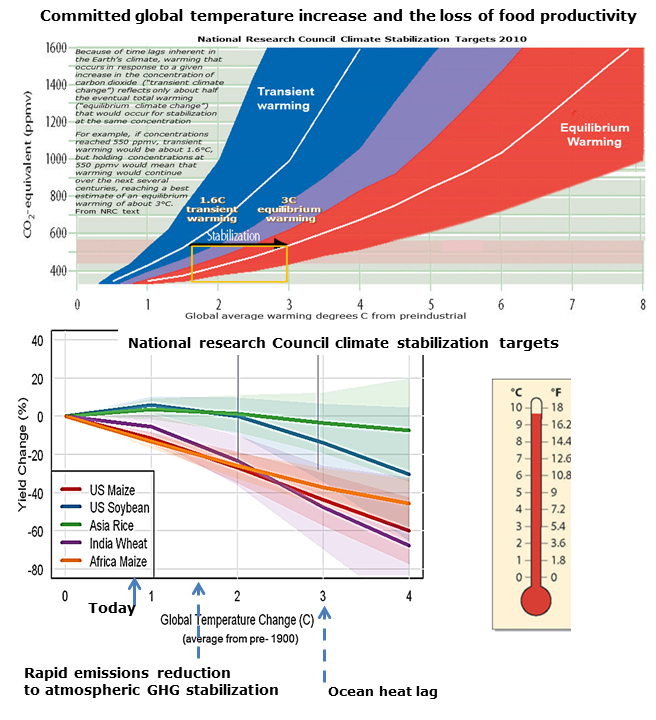 The NRC cautions that - : The expected impacts illustrated in Figure 5.1 (the climate crop models) are useful as a measure of the likely direction and magnitude of average yield changes, but fall short of a complete risk analysis which would, for instance, estimate the chance of exceeding critical thresholds. Is there a way using these model results to estimate likely critical thresholds ? The best indicator is to take the temperature increase that puts a crop into decline - peak crop yield. We are committed to an increase of 4C. The figure opposite shows two NRC graphs combined to show what food losses we are committed to as the transient temperature is allowed to rise. The upper graph shows the eventual equilibrium temperature increase is always double the transient. We are 0.8C increase today so all future generations are automatically committed to an increase 1.6C. - unless the planet is cooled artificially or CO2 removed from the air). Due to the inertia of the climate system at any time there are two global temperature increases to consider. There is today's increase (the realized or 'transient' increase) and the eventual future temperature increase that the transient increase commits the future to (the equilibrium increase). The NRC says the equilibrium increase is almost double today's transient increase. So if we stopped all GHG emissions on an emergency all out basis the temperature would much more than double. The three worst impacted regional crops follow about the same declining plot. That puts all three committed to a 20% crop loss of a major crop today. By the policy of allowing the global temperature to increase to 2C all three are committed to a loss of 20%. NRC global tyemperature increase commitment from ocean heat lag with NRC crops yield changes. 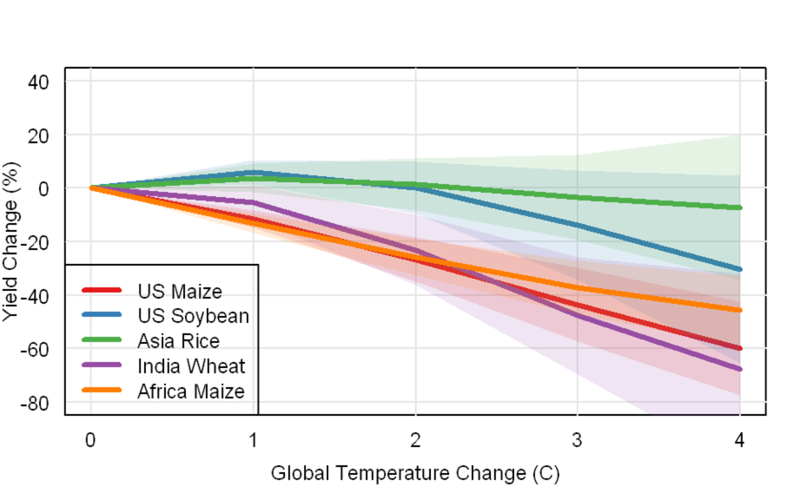 Climate crop model results NRC 2010 assessment. The worlds best food producing in the temperate N. hemisphere are committed to suffering large losses. This ​​NRC report is in fact a comprehensive global climate change risk assessment. As such it is the latest and arguably the best on the food security.